At the end of Parshas Pinchas, we read of the various communal offerings made in the Temple on the mo'adim - the special "appointed" times of the year. Conventionally, the term mo'adim includes all the various festivals of the Jewish year, thus the Torah goes on to list the communal offerings of the festivals of Passover, Shavuos, Rosh Hashana, Yom Kippur, Sukkos and Shemini Atzeres. However, the Torah's discussion of the special offerings of the mo'adim seems to go far beyond the conventional understanding of the term, and includes not only the festivals but also Rosh Chodesh (the new month), the Sabbath, and even the daily tamid offering. God appointed מועדים, special occasions that attest to His rule and summon His people to His presence, to commemorate annually His mighty acts in Egypt, at the Red Sea, on Mount Sinai and in the wilderness. These miracles actually involved suspension by God of the natural order which He Himself had instituted, and thus bear eloquent witness to His greatness. In the same manner, God also appointed the transitions of morning and evening, which occur daily with clock-like regularity, to be מועדים too. These daily, "ordinary" natural phenomena are also to serve as messengers testifying to God's power and summoning the people to worship Him, to demonstrate to us the hand of God as it can be seen even in the course of the world, and to call each of us to come before Him. For the very steadiness, the regularity, of the phenomena of nature is a much clearer, more wonderful manifestation of Divine wisdom and omnipotence than the suspension of these natural laws when God's miracles were executed. In fact the purpose of these special acts of God which interrupted the regular order of nature was to point to Him as the Lawgiver of these natural laws, lest the thought of Him as Regulator, Master, and Lord of the world order be lost through the steady regularity of the natural phenomena. In this passage, Rav Hirsch is articulating a very basic concept. Contrary to how we often think, the laws of nature are no less a product of God's will and power than even the most dramatic open miracles. In fact, fundamentally, the only distinction between the laws of nature and open miracles is that God apparently prefers the laws of nature to be the "normal" mode of operation for His universe. As Rav Hirsch points out, both here and elsewhere in his writings, the regularity and predictability of the natural laws can cause us to overlook or forget that they are not fundamentally any different from outright miracles. Indeed, the primary function of miracles is precisely to remind us that all of the natural world is subject to God's will, and that even the most ordinary of natural events is actually a miracle. ומן הניסים הגדולים המפורסמים אדם מודה בנסים הנסתרים, שהם יסוד התורה כולה. שאין לאדם חלק בתורת משה רבינו עד שיאמין שכל דברינו ומקרינו כולם נסים, אין בהם טבע ומנהגו שך עולם, בין ברבים בין ביחיד. From the great public miracles, man is led to acknowledge the hidden miracles, for they (i.e. the hidden miracles) are the foundation of the entire Torah. For a man can have no share in the Torah of Moses until he believes that everything that happens to us, whether as a community or as individuals, is entirely miraculous, and there is no element of "nature" or "the way of the world" in them. Sometimes people, especially children, ask why God doesn't perform miracles for us nowadays. In fact, with the exception of the period immediately following the Exodus from Egypt, miracles have always been relatively rare events. Even in the days of the prophets, the ordinary Jew lived a life governed, on the surface at least, by natural laws. Why doesn't God perform miracles for on a regular basis? Wouldn't that make it easier for us to be better and more faithful Jews? There are many answers to this question (not the least being that, as we see from the sins of the golden calf and the spies, the mere fact that one has witnessed open miracles does not ensure that one will avoid even obvious sins). This principle that we have just learned from Rav Hirsch and the Ramban gives us a deeper insight into why this is so. Ultimately, the will of God is not that we should recognize Him when He performs open miracles. God wants us to recognize His presence in every aspect of the natural world. In even the most ordinary and mundane elements of life, we should see the wisdom and kindness of the Creator. One recent figure who truly embodied this idea was Rav Avigdor Miller ז"ל (d.2001). Rav Miller was famous for his ability to appreciate the wisdom and kindness of God in every aspect of life. 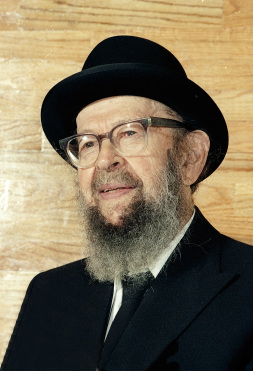 I once heard Rav Simcha Bunim Cohen, a prominent Lakewood rabbi who is married to Rav Miller's granddaughter, speak of a minor incident he witnessed with Rav Miller that illustrated his unique ability in this area. Rabbi Cohen was accompanying Rav Miller on one of his regular walks in Rav Miller's Brooklyn neighborhood. As they were walking, Rav Miller noticed a peach pit lying on the sidewalk. Pausing in his walk, Rav Miller began to jump up and down on the peach pit. Somewhat bemused by Rav Miller's surprising behavior, Rabbi Cohen asked him what he was doing. Rav Miller pointed to the peach pit and asked him if it appeared damaged. Rabbi Cohen responded that it looked fine. Then Rav Miller pointed out that the peach pit is so hard that he had been unable to break it open even by jumping up and down on it, yet if it was placed in the ground and watered, after a while it would simply open up on its own and a delicate new plant would grow from it, eventually developing into a new peach tree. From this we see the wisdom and kindness of the Creator, Rav Miller continued, for he provided the seed with a strong protective shell, yet that hard shell will automatically open when it is time for the young tree to come out. This story represents an ideal that we all need to work towards. We need to be aware of God's presence, of His wisdom and kindness, in every moment of our lives. We should see him in the food we eat, in the functioning of our bodies, and in every aspect, both human and natural, of the world around us. Rav Miller himself wrote a great deal about this idea, much of which is based upon the classic mussar work, Chovos HaLevavos . In particular, the second section of the Chovos HaLevavos, called the Shaar HaBechina (The Gate of Examination), focuses on this essential concept.